Back pad adjusts from 0 to 70 degrees. Space-saving design allows a flat and an incline bench in one piece. Integrated wheels and handle facilitate movement around facility. Bench offers eight positions of adjustment from. 15 to 30 degrees. Leg pads designed in fixed position for easy. Entry and exit Integrated wheels facilitate movement around facility. 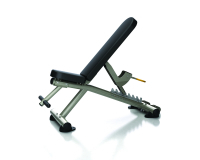 Bench is angled 45 degrees for easy entry and exit and is ideal for lower-back exercise. Nine positions of adjustment provide 9.5" of adjustment for users of most heights. 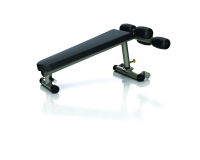 Footrests incorporate lower-leg pads for stabilization and comfort. Bench has 3-point contact for improved leveling. Integrated foot supports for greater user stability. Integrated wheels facilitate movement around facility. Space-saving design allows a flat and an incline bench in one piece, Seat pad adjusts from 0 to 30 degrees. while back pad adjusts from -5 to 85 degrees. Integrated wheels and handle facilitate movement around facility. Bench is angled at 15 degrees for effective muscle stimulation. Three take-off positions provide adaptability for users with varying arm lengths. Tibia adjuster allows for near-infinite adjustment positions. Multiple weight take-off points are spread 6" apart. 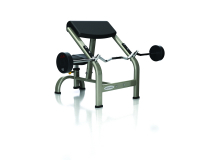 Standard weight storage keeps weight plates in close proximity. 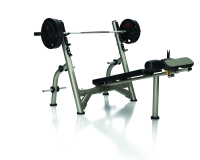 Bench is angled 30 degrees to emphasize upper pectorals. 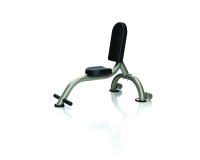 Adjustable seat allows fine-tuning of the exercise position. 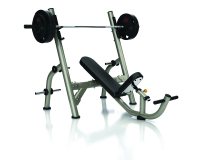 Standard weight storage keeps weight plates in close proximity. Elbow pad is angled at 55 degrees to vary resistance and improve user comfort. Seat pad is angled at 10 degrees to improve stability and comfort. Back angle is 85 degrees, improving comfort and stability for overhead movements. 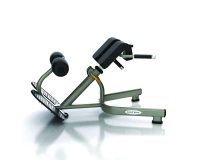 Integrated foot supports increase stability. Integrated wheels facilitate movement around facility.